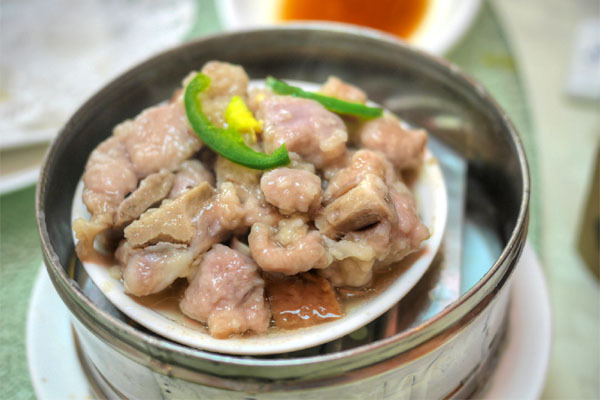 The dim sum place du jour these days seems to be Shi Hai ("Sea World"), largely thanks to Jonathan Gold's recent write-up of it in the LAT I'm guessing. 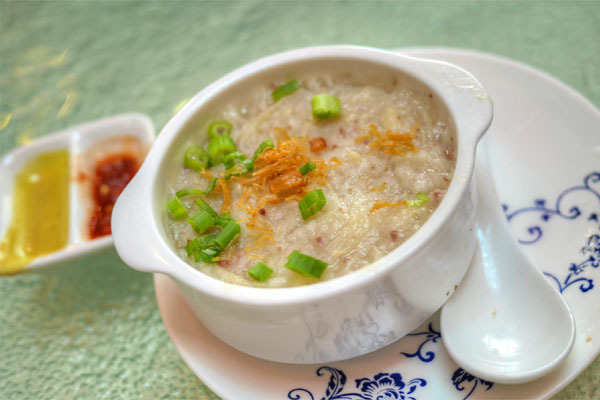 The restaurant debuted in July, and is a Hong Kong-style seafooder from Haiping "Jeff" Huang. Basically a new construction, it occupies the shell of the old Blue Ocean Seafood (MPV Seafood until 2008), which burned nearly to the ground in May 2011, as well as D&F BBQ next door (which holds most of Shi Hai's private dining rooms). 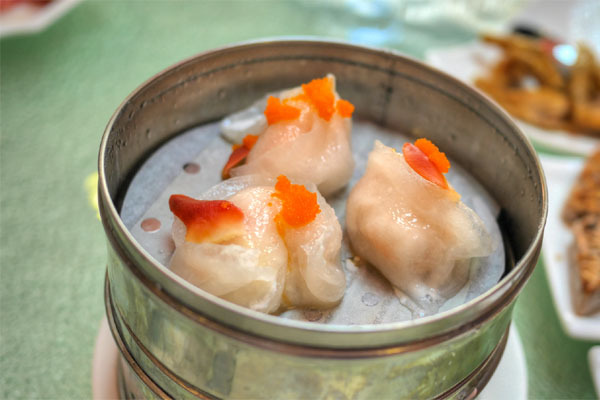 Above, we see Shi Hai's dim sum menu, which covers most of the typical bases. In addition to all this, you also have the option of ordering off the dinner menu (not pictured), which is a thick, glossy, well-photographed affair that may just be the physically fanciest menu I'd ever seen. Click for larger versions. Given the limited alcohol situation here, we rolled in BYOB style. 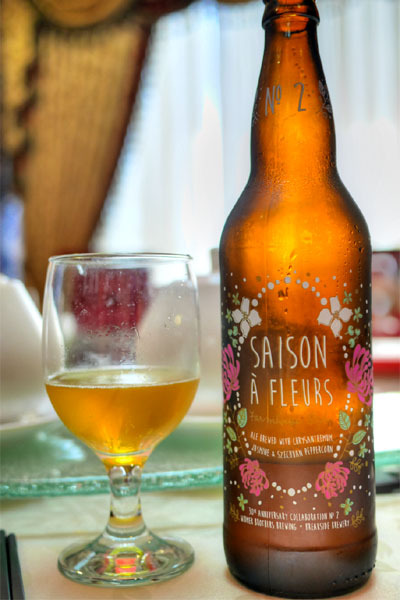 Our first beer was the 2014 Widmer Brothers Saison À Fleurs, which seemed very apropos for the surroundings given the brew's incorporation of chrysanthemum, jasmine, and Sichuan peppercorn. I took a liking to this one, finding it a good mix of classic saison character intertwined with spicy, fruity, flowery nuances. 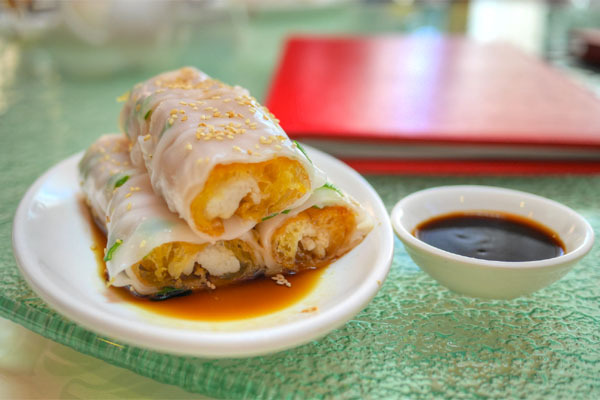 We began with much bandied about zhaliang rice noodle rolls, which were admittedly rather tasty. 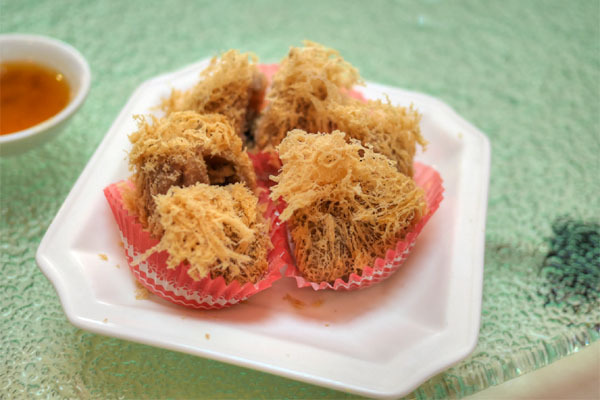 The wrappers were slick and gelatinous, a fitting foil to the crispness of their sweet-n-savory youtiao-slash-shrimp mousse stuffing. You should probably get this. The baked chicken bun isn't something that I have all that often, but was pretty serviceable, with a slight sweetness to the bao to go along with the bird. 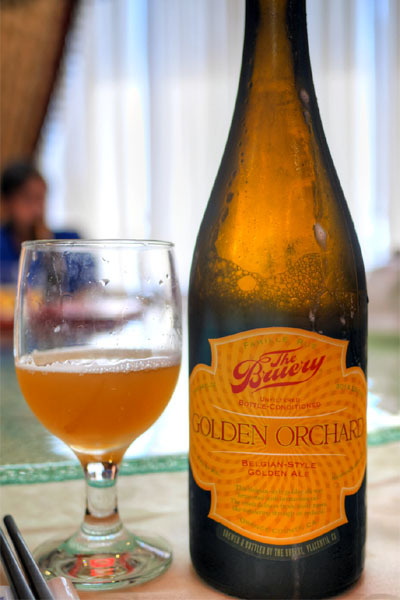 The 2014 The Bruery Golden Orchard is a new release from the brewery, a Belgian-style golden ale fermented with Brettanomyces. It really was quite delicious, delivering a blast of crisp, malty, subtly funky flavors accented by a fresh, fruity (apples?) quality and just a touch of bitterness. Xia chang was a laudable version of the classic noodle roll, the shrimp arriving snappy and nicely brined, though I wanted to taste more from the asparagus. The classic cha siu bao seemed to be quite good judging from my dining companions' reactions. I didn't get to taste it though, as the kitchen somehow managed to run out of the buns, which perplexes me (they gave us the chicken buns above as a substitute). 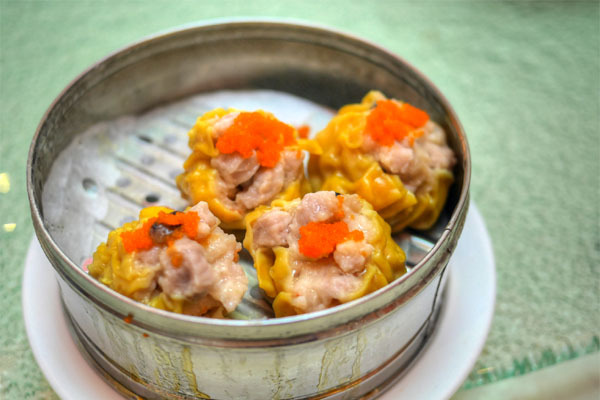 Siu mai were on point however, plump and springy and brimming with porky goodness offset by just a smidge of brine. 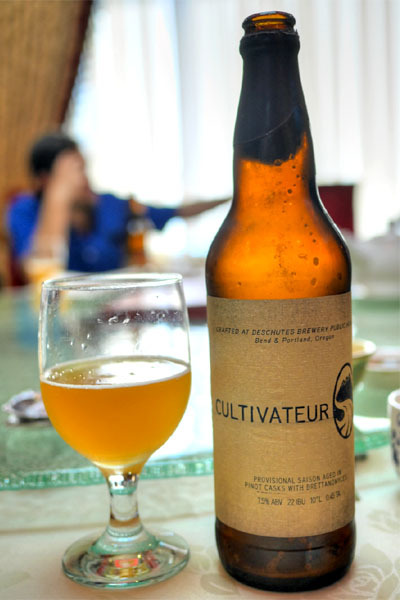 The 2014 Deschutes Cultivateur is a limited-edition, brewery-only Pub Reserve Series release that comprises four different batches of Pinot and oak cask-aged saison, aged for three, four, and 13 months with a mixture of Brettanomyces bruxellensis, Brettanomyces lambicus, Lactobacillus, and Pediococcus. The resultant beer was delicious, with plenty of barnyard and stonefruit on the nose and a taste that veered crisp, tangy, and funky, with a nice touch of hoppiness to it all. 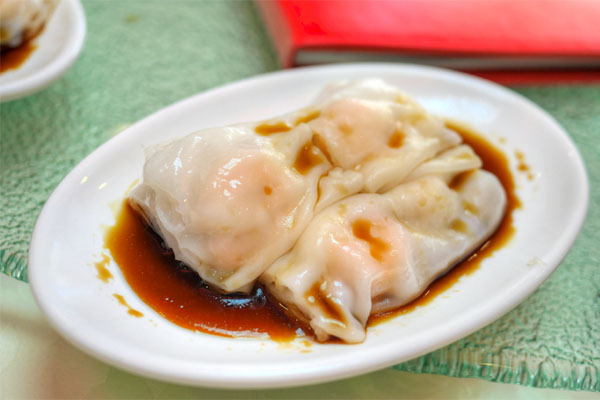 Har gow were pretty tasty, perhaps a touch gummy with regard to the skin, but stuffed with a thoroughly enjoyable filling of well-cooked shrimp. I liked the paigu here more than I thought I would, the ribs conveying a pleasant bit of porkiness enhanced by the depth of the accompanying sauce. 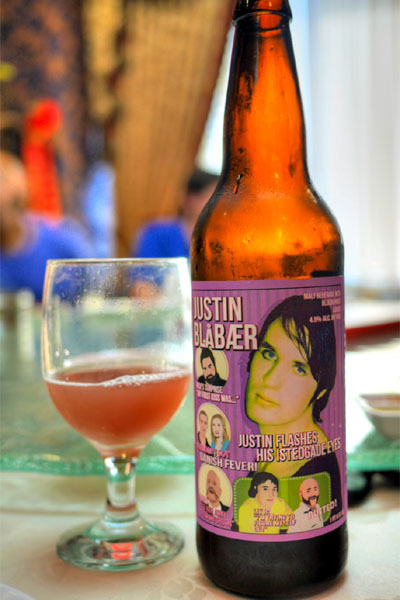 Next up was the Evil Twin Justin Blåbaer, quite possibly the best-monikered beer since Beachwood's Jean-Quad Van Damme. A blueberry Berliner Weisse, this one was to my liking, showing off some tart berry goodness on the nose and more on the palate, where it was joined by a palpable citric character and a touch of wheatiness. 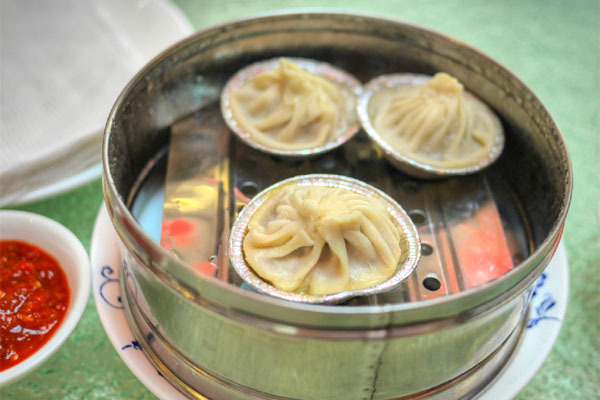 Xiaolongbao were a pleasant surprise, arriving appropriately juicy and teeming with porcine goodness. 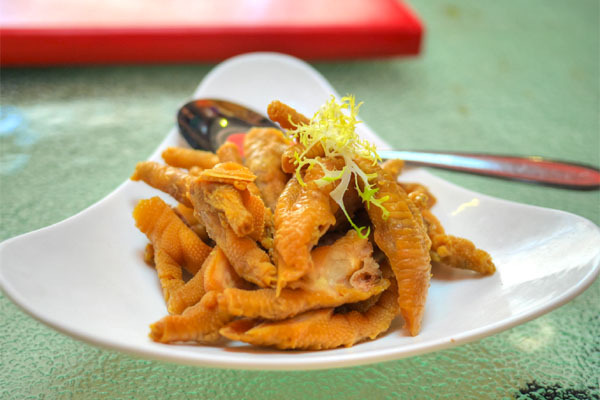 This preparation of chicken feet didn't do much for me--cold, bonier than usual, a bit bland--but then again, I'm not a fan of feng zhua in the first place. 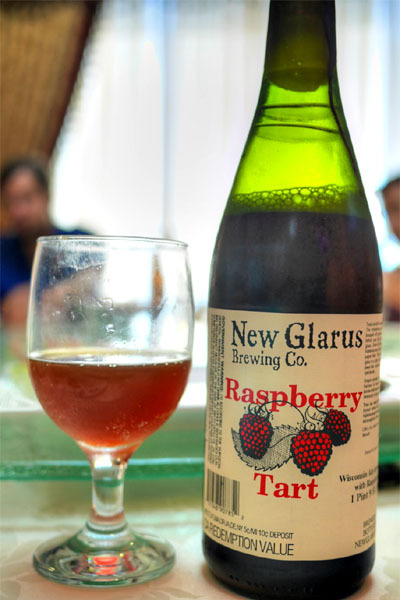 Sticking with the fruit theme, our next bottle was the spontaneously fermented New Glarus Raspberry Tart from Wisconsin. The beer was positively jammy in terms of aroma, while taste-wise you got more of that in-your-face fruitiness, but cut by a marked tartness and oaky tinge. 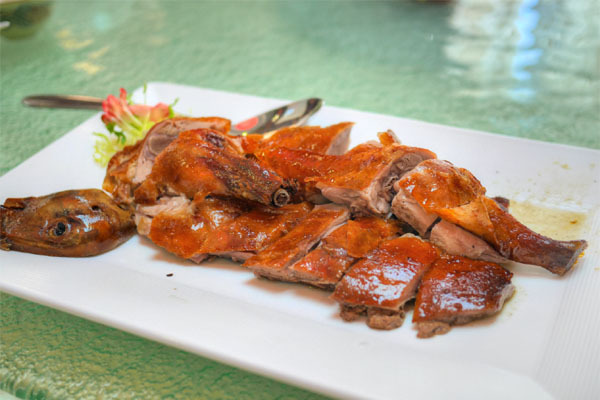 The barbeque duck made a nice showing for itself, displaying a depth of "ducky" flavors accompanied by nuances of sweet spice. Good crispness on the skin, too. 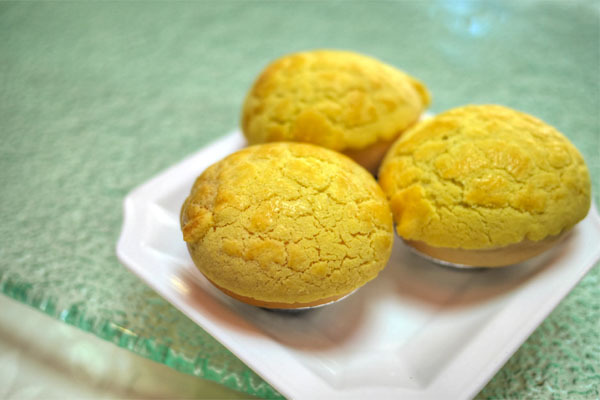 The yutou jiao were another standout for me: light, fluffy, and wonderfully crisp, with a great bit of delicate savoriness to them. 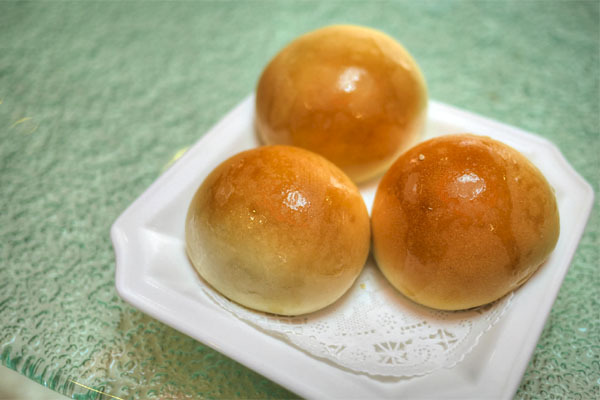 Though I missed out on the baked chashao bao above, I did try the steamed version, and enjoyed it, the soft, airy, yet dense bun really soaking up the sweet-salty nuances of the pork. 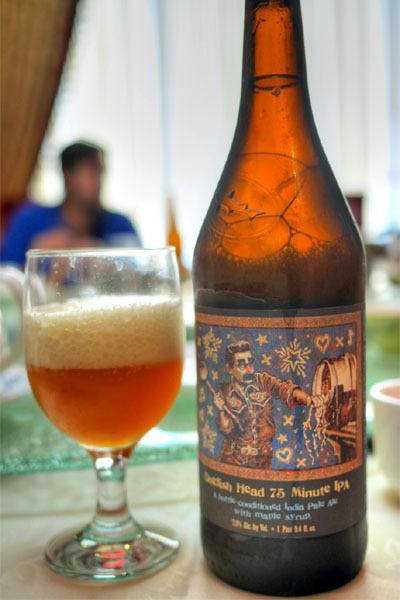 The lone India Pale Ale of the group was the 2013 Dogfish Head 75 Minute IPA, a blend of 60 and 90 Minute IPAs that's dry-hopped with Cascade, then doused with maple syrup and cask-conditioned. The beer was a treat, sweet yet hoppy on the nose, with a great interaction between the hops and malt on the tongue, all joined by an undercurrent of sugary maple, especially toward the finish. We only ordered one round of the standard feng zhua as well, so I didn't end up partaking. The others seemed to enjoy it, however. 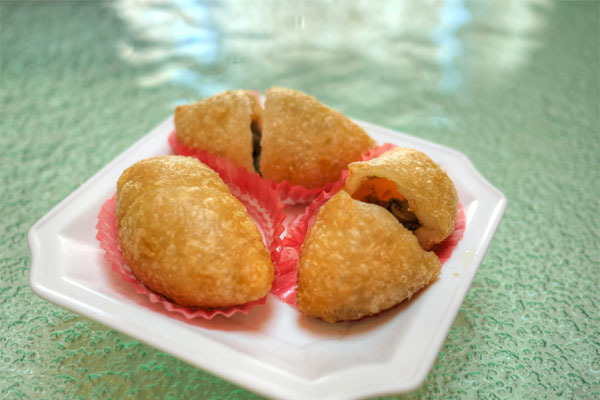 Another favorite was the xian shuijiao, which I affectionately refer to as the "footballs." The key was the interplay between the sweet, sticky, substantial skin and the salty meat within. Yum. 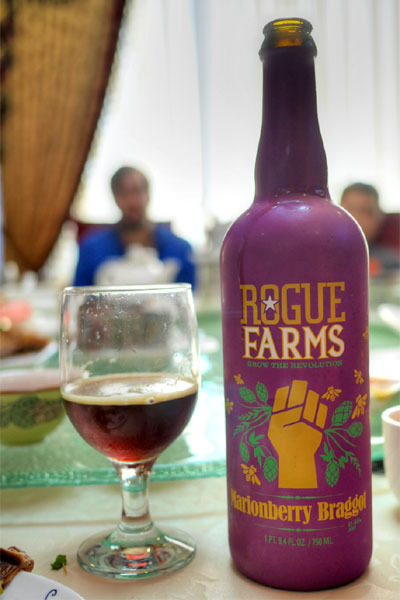 Here we had the 2014 Rogue Farms Marionberry Braggot, a style that I'd actually never tasted before, in essence a mead (honey wine) with malts, hops, and blackberries. I found it intriguing, but enjoyable, smelling of sweet, honeyed spice and berry fruit and tasting much of the same, but with the addition of maltiness, hop bitterness, and a touch of herbiness. 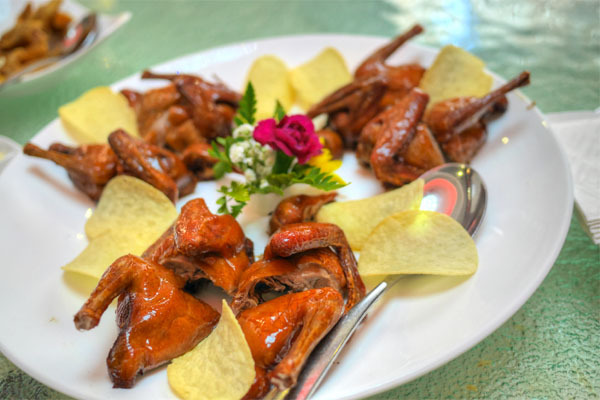 Another one of Shi Hai's oft talked about dishes is the baby pigeon. It definitely showed off the deep, earthy, intense flavors that you'd expect with squab, all evened out by the sweet, crisp skin and what I believe were Pringles. 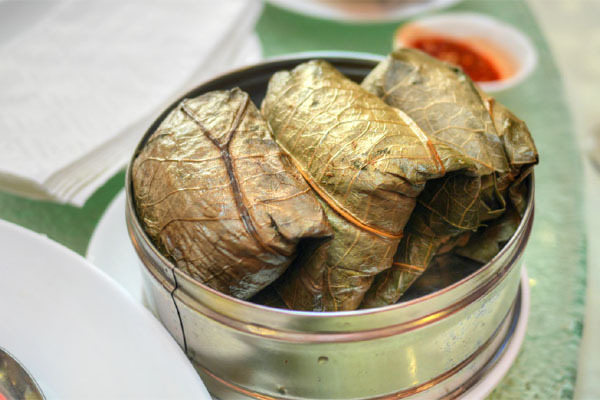 I enjoyed the lo mai gai as well, a lotus leaf-wrapped contraption hiding a stuffing of glutinous rice and other savory fillings (mushrooms and chicken I'm guessing). Mouseover for a secondary photo. A scallop-fied version of yutou gao was a rarity for me, but also one of my favorites here, with the salinity of the bivalve doing an admirable job in setting off the mild, dense taro cake. Lovely textures, too: crisp on the outside, but soft and yielding on the inside. 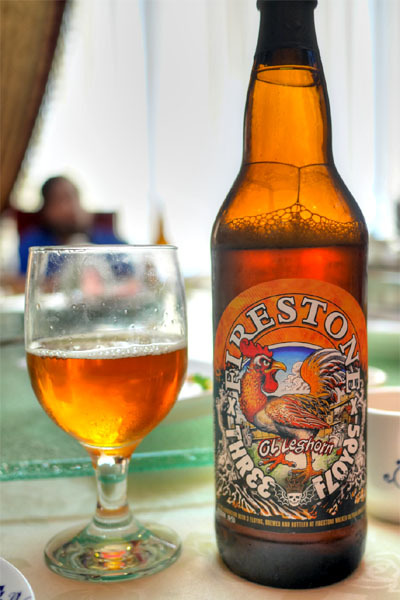 My last beer brought out the 2014 Firestone Walker Ol' Leghorn, a collaborative brew with Three Floyds first concocted during last year's FW Invitational Beer Fest. Done in the blonde barleywine style, this was aged in both new American oak and bourbon barrels, then blended with a freshly dry-hopped version of the same beer. The end result was a bit unexpected, with the caramel-y, barrel-y, malty qualities of the beer dominated by a bright, hoppy, citric character. Our penultimate dish combined shrimp, surf clam, and crab roe in dumpling form. I'd never seen anything quite like this before at dim sum, but it worked out swimmingly, a real celebration of ocean-y goodness tempered only just by the presence of the wrappers. 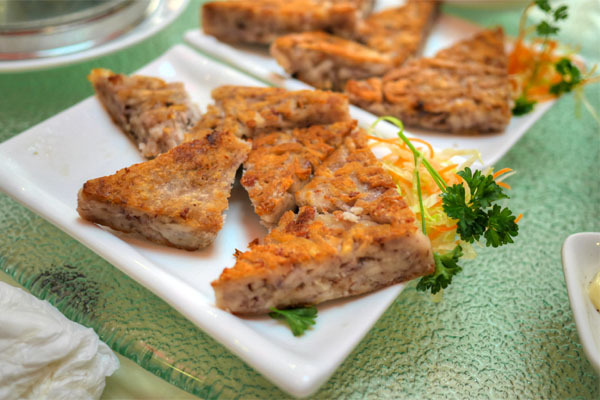 Finally, though Shi Hai somehow lacked pan-fried luobo gao, we did get the steamed version, a pretty spot on rendition of the dish showcasing the mild, gelatinous radish against the savory sprinklings on top. Despite the meal being cut short due to the kitchen closing (there were a number of additional items we wanted to try), we all left Shi Hai pleasantly surprised. 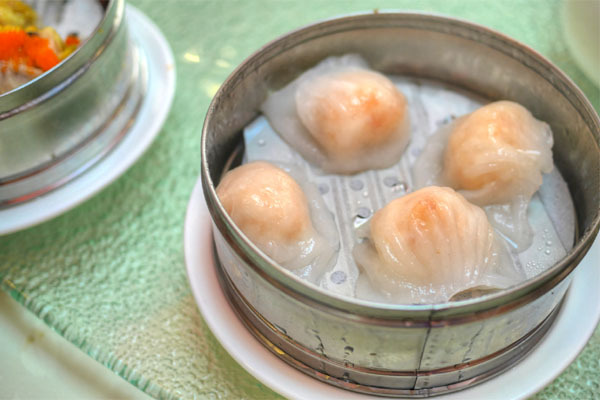 I'd rank it as one of the better dim sum experiences I've had, above my recent experience at Lunasia in fact. It wasn't particularly expensive either, coming in at $20.49 a head (pre-tip) inclusive of the pricier non-dim sum items such as that squab. 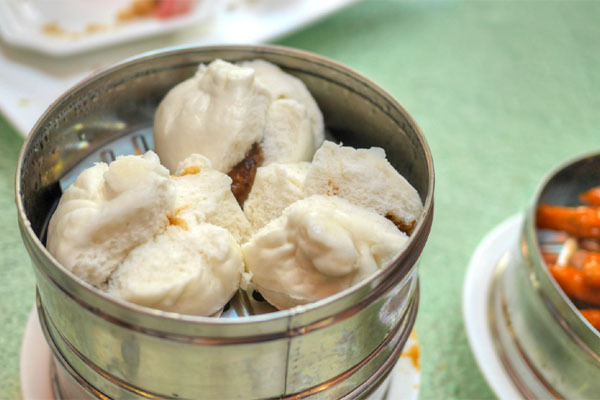 The place is certainly worth a try for all you yum cha fiends out there (and I know there are a lot of you). 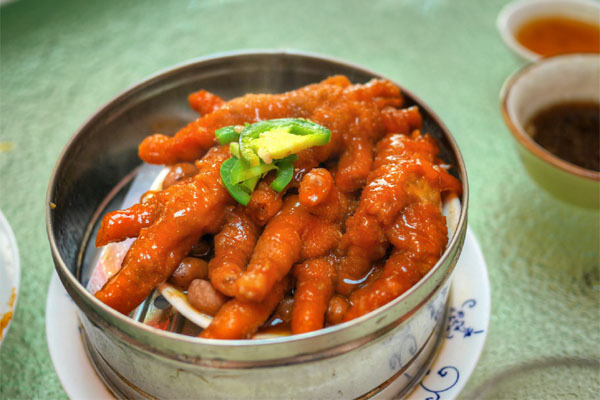 Lots of Chinese food lately compared to the past, change of appetite? Sigh. Now I'm just going to have to get here. Last week, when I was hung over, I debated about trying it, but went to Elite instead because it was well... a totally known great. I also checked out the rebooted Empress Pavilion downtown. Yech. Report coming soon. Look for it on my Chinese page. But Shi Hai looks pretty good. I wonder how it is compared to the current first tier (Elite & King Hua). Lunasia is in my second tier (still very good). I dont think that "shi" is the number four. Andy, text me when you go maybe i'll join you if I'm free! Kevin: You get any btls of KRBC Citra Double? Anon: I guess you could say so. It's a bit of a renewed interest in the cuisine I suppose. Andy: You should definitely check this place out. My guess is that you'll rank it below the likes of Elite and King Hua, but above Lunasia. I'll admit I'm a bit curious about the revamped Empress Pavilion though. Anon: I'll probably head over soon to pick up my Black Tuesdays. Why? Anon: You're correct; I should've read the characters first. Post has been updated. Charlie: Nope. It's too far of a drive for me. Did you? Finally got to Shi Hai myself. It was good, but not quite as good as Elite and King Hua, mostly because of that think extra sticky dumpling shell on the semi-translucent dumplings (like har gow). They have a nice menu of choices though.